In the last couple of months I’ve racked up a few more thousand miles in the X bike. 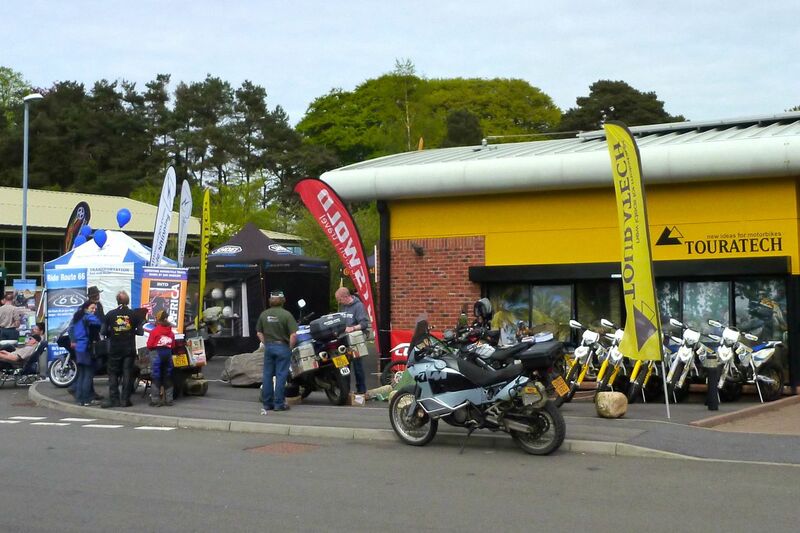 In May I had a chance to test the new suspension on a heavily loaded ride to the Touratech event in south Wales. A twist on the pre-load knob on the Hyperpro shock dealt with 20kg of books with all the rest. 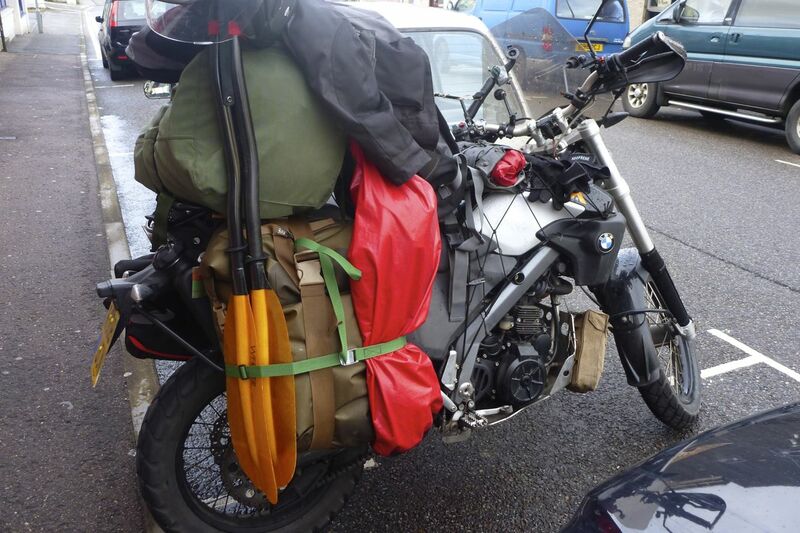 The Adv Spec Magadan IIs I’d bought weren’t in yet so I lashed up some all-weather luggage using Watershed kayak bags of which I’m a big fan. At the rally I met another bloke with an XCo who’d made a neat job of slotting in a Rotopax can. With a siphon, it’s not as handy set up as my Xtank, but it could easily be adapted to work just as seamlessly. This guy also gave me a tip about fitting a Booster plug to richen up the mixture and smooth out the engine a bit. Some days I think it’s something the bike could use. 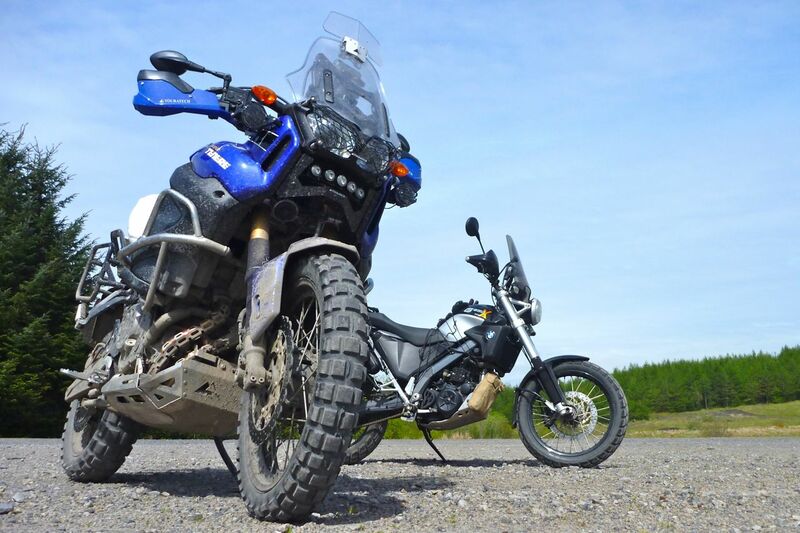 I also had a ride on Nick Plumb’s Super Tenere (left) which had been blinged to within an inch of its life. What a stonking motor that is! The secret: 270° cranks for that lovely V-twin feel. 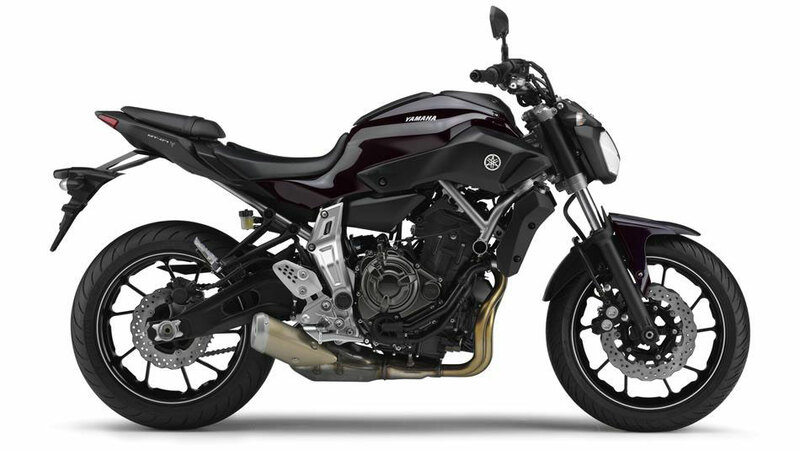 They say the new Tenere may be based on the current Yamaha MT-07, 700cc, 270° twin (right). The MT seems to be going down well with the testers as a return to simple and cheap fun biking. new Tenere or something else, my next bike is going to be a 270. 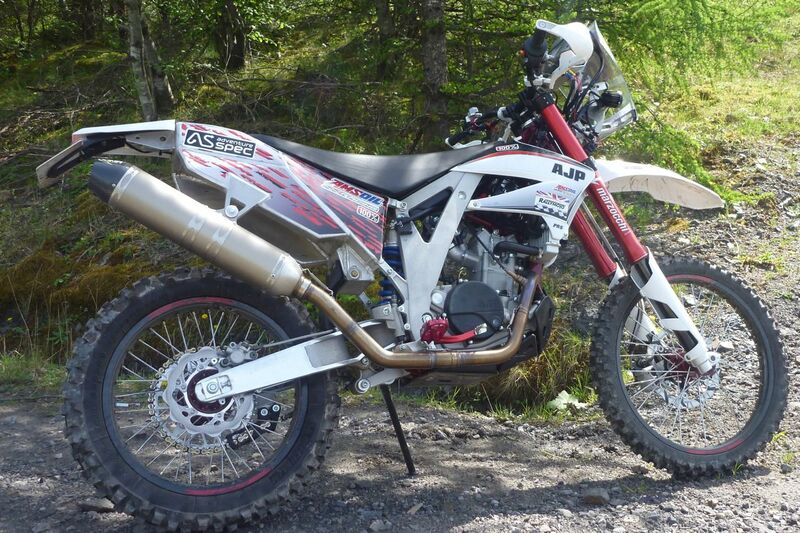 The other bike I tried was some sort of AJP 250 enduro racer (right) with a bloke who interviewed me for TBM. We were up at the BMW off-road course, a brilliant venue with excellent traction and all sots of levels of challenge. That’s not me hooning about in the other pictures, but one of the BMW testers in full neck brace. 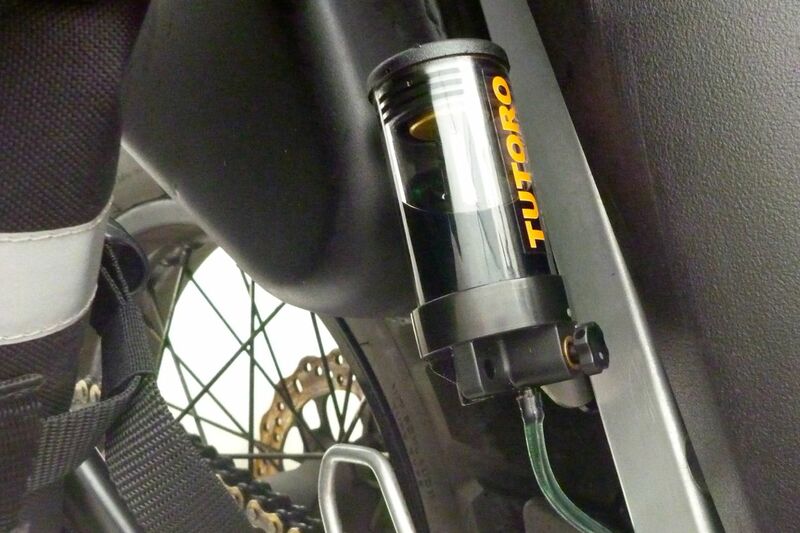 While at Touratech I fitted a Tuturo automatic chain oiler (left). For the full review click the link, short version: for me it the best solution to that necessary task. After the event I sped off north through Wales trying to give my new springs a work out. The back ends works well, as you’d expect, but the refined front end (new Hyperpro springs and oil, seals and gaiters) has the effect of making the front tyre more sensitive to road irregularities. More information is good I suppose. Crossing the border and filling up south of Glasgow a day or two later, I pulled away on a lovely smooth engine. I often get this with big singles and can only put it down to varying fuel quality, or perhaps a long motorway blast then cooling off? Either way, I knew the annoying big-single lumpiness would return after more docile riding. Maybe the ECU resets following in town riding? I have a hope that Booster plug will make a difference as this as, along with the horrible 1st to 2nd gear change, it spoils this bike. 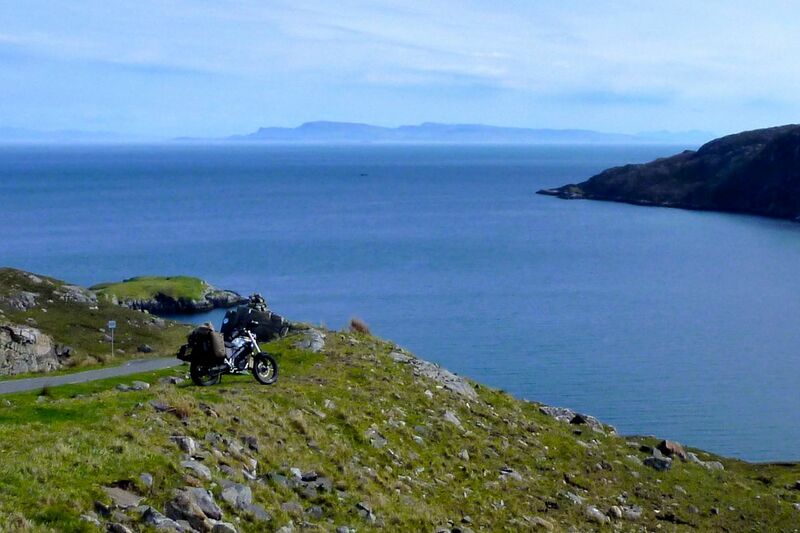 I rode into Oban, parked the bike in a hostel and spent four days kayaking round the Slate Islands with a French mate who’d brought my boat and kit up in his car. 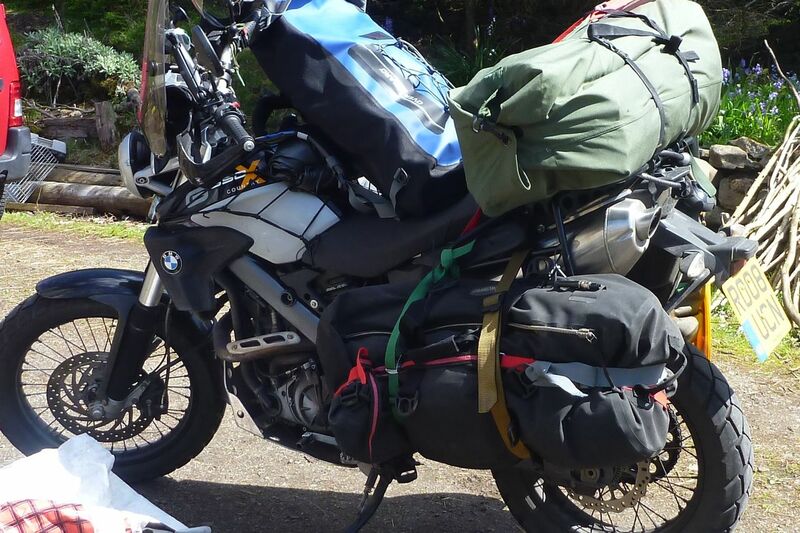 When that was done, I piled my 14-foot kayak, packraft, and a whole lot of other stuff (left) on the X machine for a cautious ride up beyond Ullapool. Here I hooked up with Desert Riders Jon for an overnight packraft trek across the lochs of the Assynt. Very nice indeed. 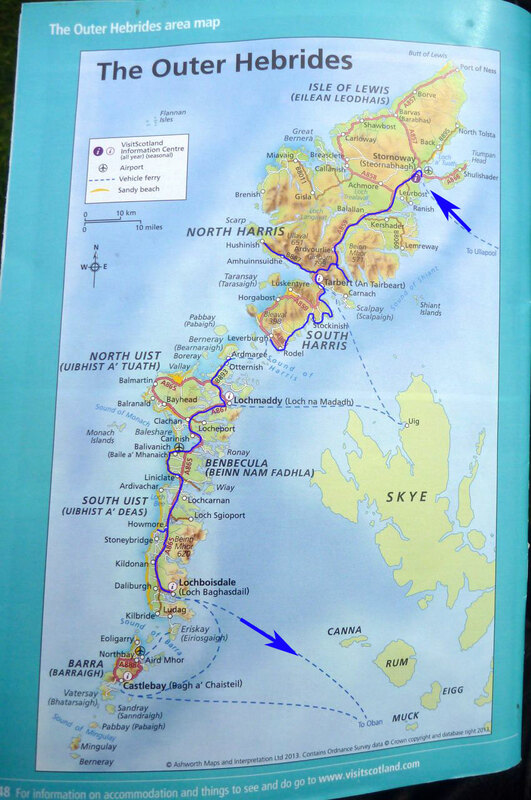 I left my boats up there for later, then ferried from Ullapool to Stornoway for a run down through the Outer Hebrides; one of Britain’s must-do rides. 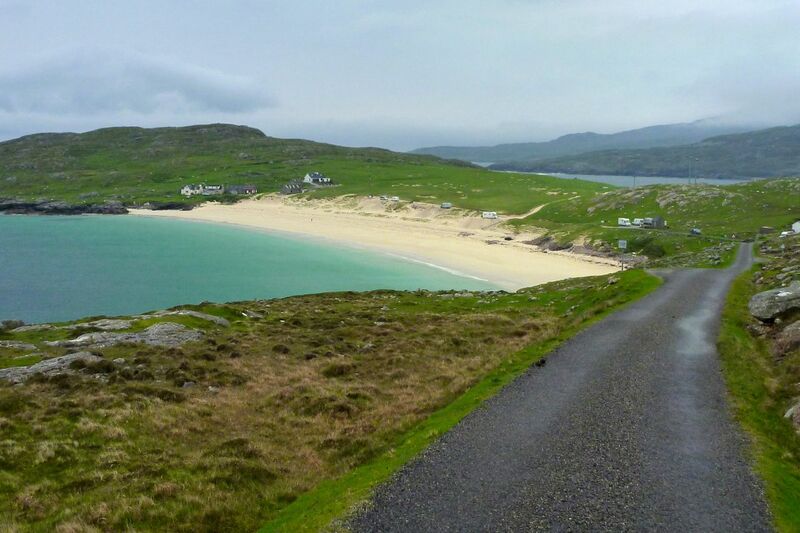 The CalMac ferry network gives you all sorts of options to return to the mainland or visit the other islands. On Harris (left) I spent the night at the lovely Rhenigidale hostel, before riding back through the mist to the remote Hushnish beach (below right) which includes the odd experience of riding through the grounds of a baronial mansion. I then followed the single width roads on the west side of South Harris to the ferry at Leverburgh, but have to confess it’s had to get a rhythm going on such winding roads, even on a small 650. 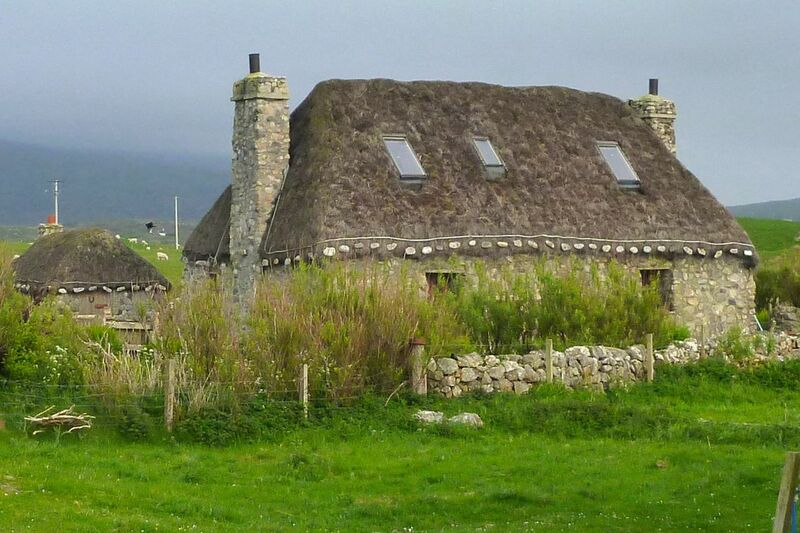 North Uist’s lovely beaches led to Benbecula and causeways to South Uist and another cute thatched Gatliff hostel at Howmore. The weather was closing in now and next day’s ferry back to Oban beat through a Force 5 chop. Incredibly, from Oban I then rode all the way to Scarborough, a fabulous ride across northern England and the North York Moors. 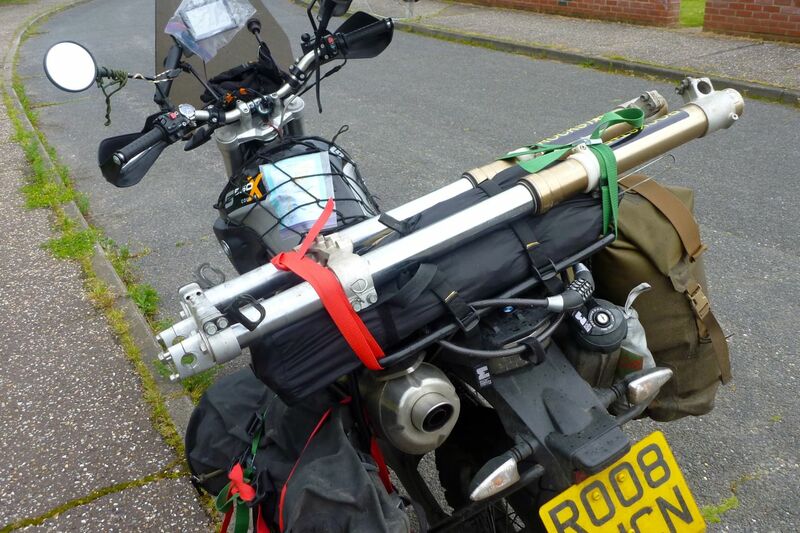 Next day I diverted via David Lambeth’s neat Boston to make an flash inspection, then over to Norwich to pick up some cheap DRZ forks to consider fitting to the Xcountry or just keep for a rainy day. It was around here, tooling through the showers, that I recorded a phenomenal 108mpg. By the end of this cross-country ride there was a noticeable step in the seat where the foam had become compressed. But I’ve since found the wide seat remains comfortable for 400-mle days. 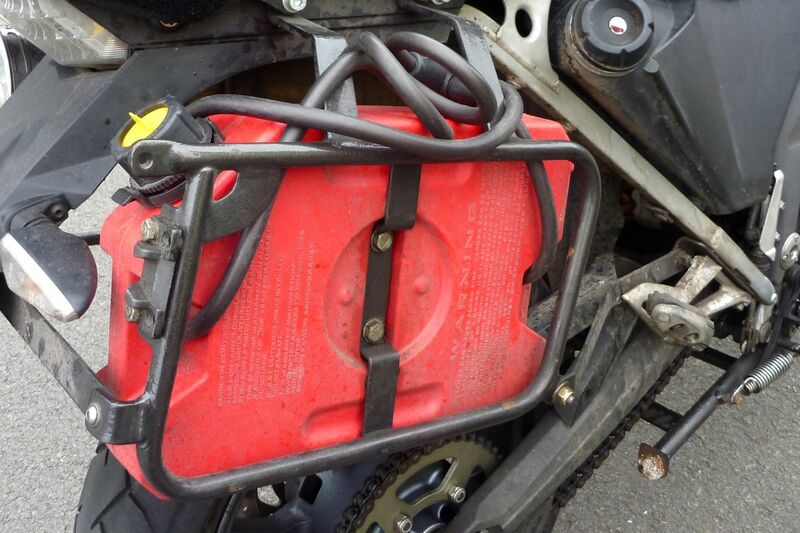 More recently I fitted the Booster Plug but can’t say the difference is huge for £90. Tick over feels a big less harsh, but overall I’m not as amazed as the bloke at TTech promised. 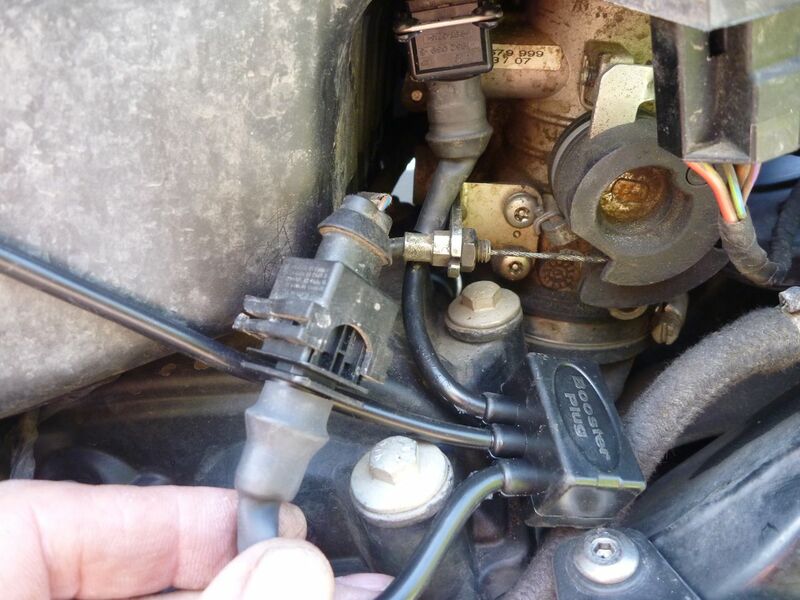 The unit is dead easy to fit: remove the left side ‘tank’ cover, unplug a lead to the air box, then splice in the booster box while running the air sensor cable out to hang behind the headlamp. The black box works by reading a lower air temp than in the air box, and richening the mixture at low rpm and on acceleration, as most modern bikes run very lean. I would hope it might also cool the bike a bit (had a mysterious drop in the expansion tank level but seems to have stabilised now). 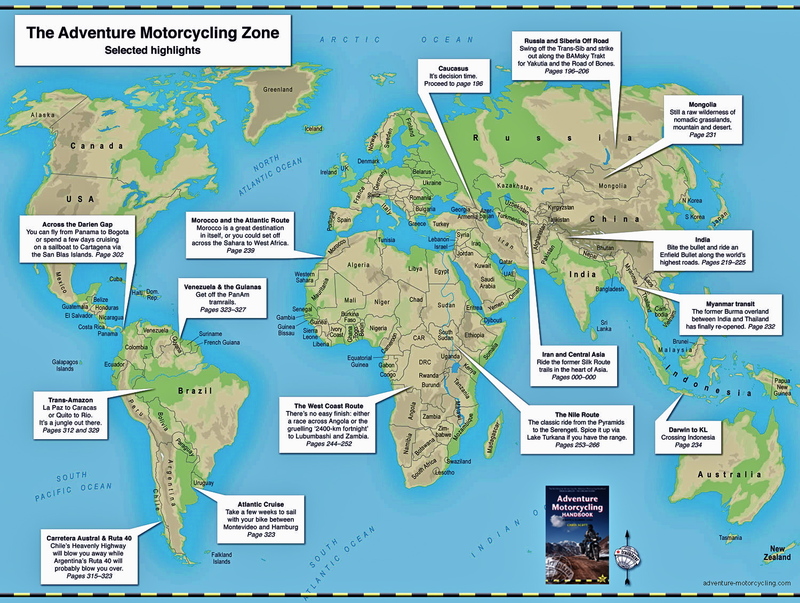 Next longish ride I may unplug then replug to compare. I’m now back in far north Scotland and after a great southern summer it seems autumn is here already, but I can say the mpg doesn’t seem to be affected. Got a pretty poor 61.5 leaving London with loaded Magadans, but next two fill were low 70s, same as usual. Talking of which, finally got to use my Magadan IIs – as good as the old ones but better with the lower attachment rings. Now I have 11,111 miles on the Xco I’ve changed for fully synthetic oil. Next things will be a pair of tyres for Morocco in November and hopefully the VisionX 5-inch Narrow Beam LED. I have to say I’m not really into the Xco. My feeling is in squeezing every last ounce of power out of it, they’ve made a sometimes harsh engine. And sadly all the necessary travel junk I’ve fitted to it has robbed it of its original lightness. Plus that gear change is awful at times the looks haven’t grown on me and I realise that matters more than I used to think. 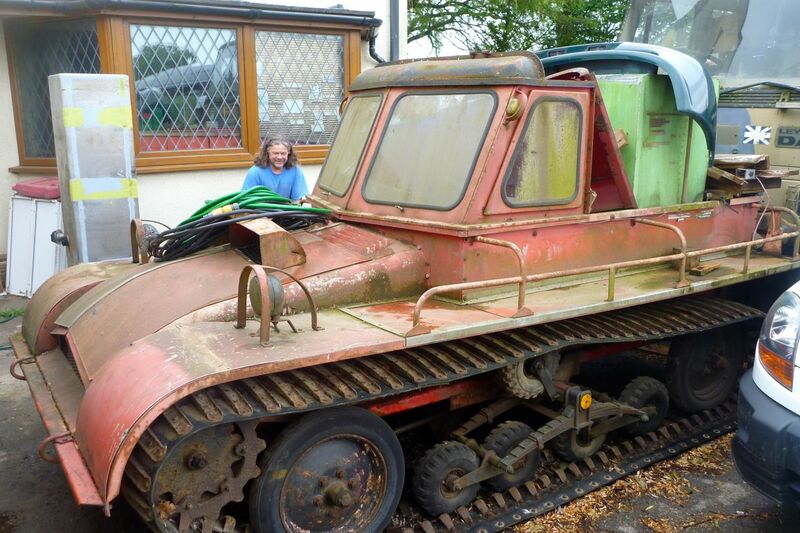 Still, rufty-tufty tyres may cure that, and for the Morocco tours it’s well equipped for the job. 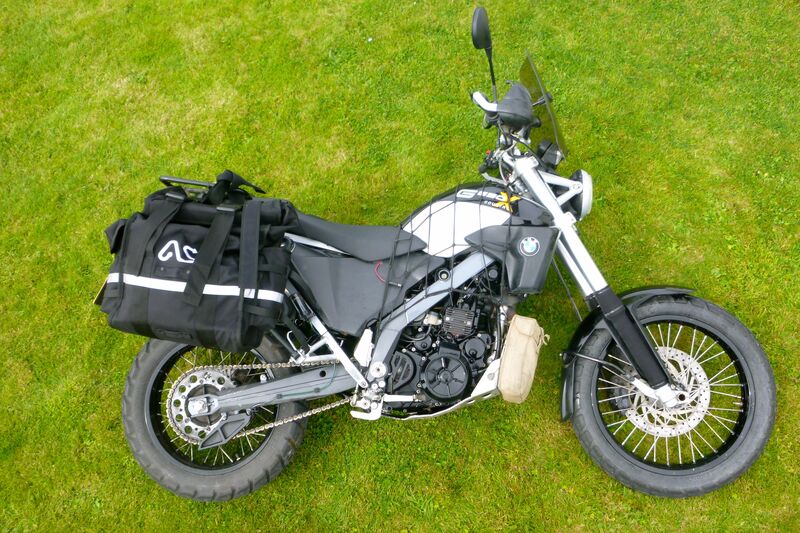 This entry was posted in AMH News and tagged Adv Spec Magadan IIs, booster plug, DRX 400 forks, Gatliff Hebridean hostels, outer Hebrides, super tenere, Tuturo automatic chain oiler, Yamaha MT-07. Bookmark the permalink.